Peter Jackson's controversial Hobbit trilogy has finally come to a close after it's two year duration; the series has not impressed the majority of fans or critics, especially when compared to the original Lord of the Rings films, but can this finale send it off on a high note? After battling the Dwarves and hobbit Bilbo Baggins (Martin Freeman) within the Lonely Mountain, the dragon Smaug (Bennedict Cumberbatch) exacts his revenge on the nearby Lake-town, burning it to ruin. Following his defeat at the hands of Bard, the Lonely Mountain is left in the possession of the Dwarves, lead by Thorin Oakenshield (Richard Armitage), who begins to succumb to his own greed and god complex. With the knowledge of Smaug's death spreading quickly, all manner of Middle Earth's cultures and creatures head for the mountain, leading to all out war between the five armies driven by a lust for dominance and the riches within. The entire Hobbit trilogy is hampered by a stretched narrative that includes too many supporting characters, unnecessary sub plots, and some absurd run times. 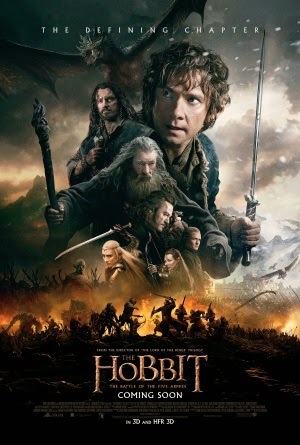 Thankfully, The Battle of the Five Armies is perhaps the installment that makes the best use of these burdens; the story comes together in a far more engrossing manner than the previous films, and some superb action sequences make for a thrilling ride from start to finish. It's slightly overwhelmed with intense battle scenes, but the climax of the war itself makes it all worthwhile. Things kick off quickly in the story with Smaug's reign over Lake-town; sadly, his badassery is over fairly soon to kick off the next phase of the narrative. In terms of aesthetics, it comes as no surprise that Hobbit is genuinely flawless, boasting some beautiful motion capture animation, superb location shoots, and some gripping battle scenes. The characters are a lot more fleshed out this time round, though it does seem rather strange that Bilbo is placed on the back burner for the majority of the storyline; an unfortunate consequence of the over abundance of supporting characters and occasional lack of focus. None of these three films provide a truly persuasive argument to make this book into such an epic trilogy, but The Battle of the Five Armies does it's best to deliver a thrilling closure to Peter Jackson's expanded plot - and succeeds.